Welcome to St. Mary’s Church, Hadlow. St. Mary’s is the Parish Church of Hadlow, Kent and has been a centre of worship for over 1000 years. You are very welcome to attend any of the regular services, and the service times can be found here. 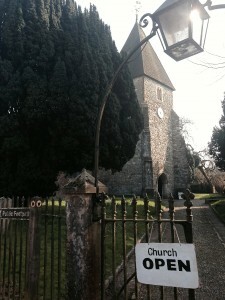 St. Mary’s is part of the Deanery of Paddock Wood and the Diocese of Rochester. Predominantly liberal catholic in ethos we are a welcoming and inclusive church that sits firmly at the heart of this community. At St. Mary’s we have a beautiful church building, a large, talented choir and a friendly and welcoming community. The church is open most weekday afternoons from 2 – 4 pm and a member of St. Mary’s will be there to welcome you. The parish includes the neighbouring village, Golden Green, where services are also held each month in the Golden Green Mission Hall. St. Mary’s is located at the end of Church Street, just off the Square in Hadlow – if you are using satnav we are at TN11 0DB. If you need to know anything that cannot yet be found on this website, please do not hesitate to call our Vicar Paul on 01732 850238.